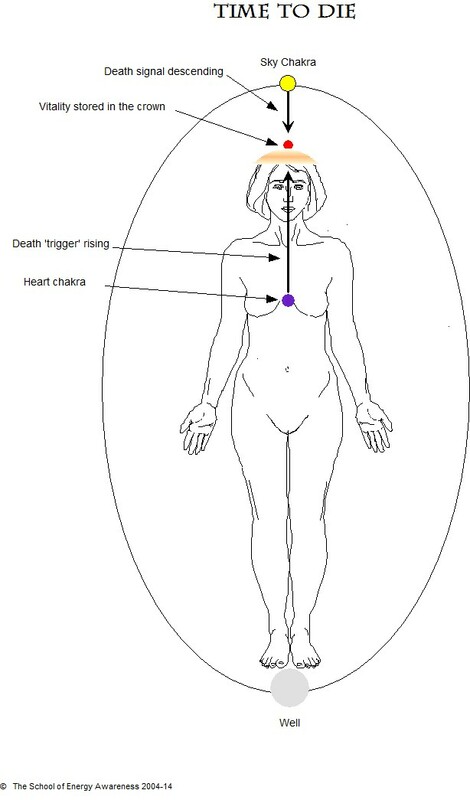 Since I first became aware of it, death [energy] has always looked the same to me as it does to other seers – a black line of energy starting at the apex of the energy field and moving straight down towards the crown chakra (at the top of each person’s head). When [the energy of] death reaches someone’s crown, it starts to penetrate the 7th chakra – a process that may take several months before physical death then ensues. However, since reviewing these photos, I’ve come to see this process in a slightly different light. For each accident victim, I noticed that the death signal is not just that descending flow of energy. When it reaches the 7th chakra, it actually extends all the way across from left to right, like a narrow band or slice stretching across the centre of the head. 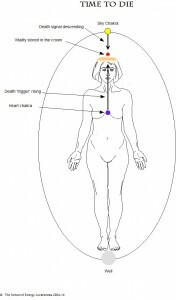 More interestingly, I noticed the descending ‘death signal’ was, in every case, preceded by a ‘trigger signal’ rising up from each person’s heart chakra to their crown. One could say, from this sequence, that they (their heart chakra) ‘called’ their death to them.